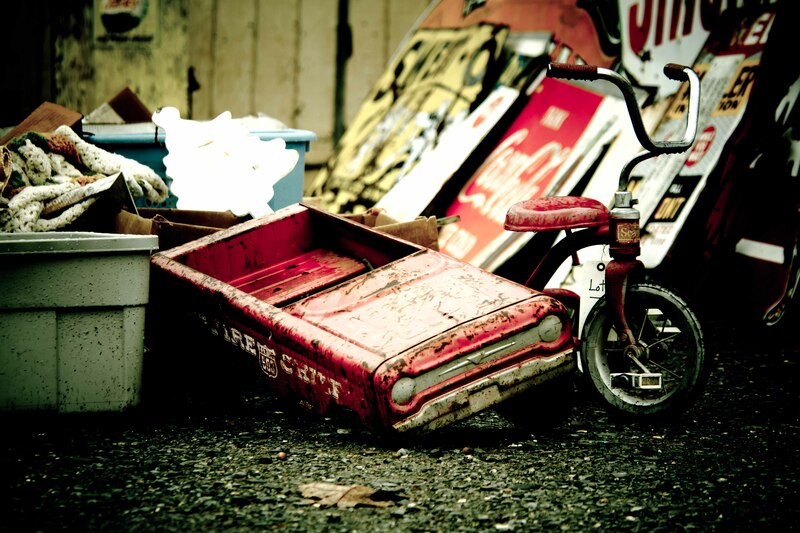 As a remodeling contractor, interior designer, and Charlotte homeowner, one of my favorite winter pastimes is repurposing antiques and other used materials into home décor items. 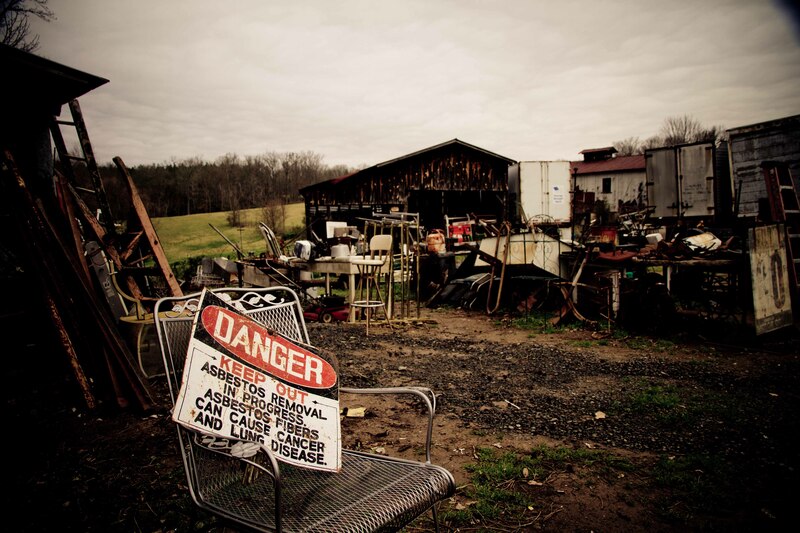 Charlotte has a plethora of antique stores, but a recent CLT Blog post by Carlos Lopez about Cline’s Antiques on Highway 49 in Mt. 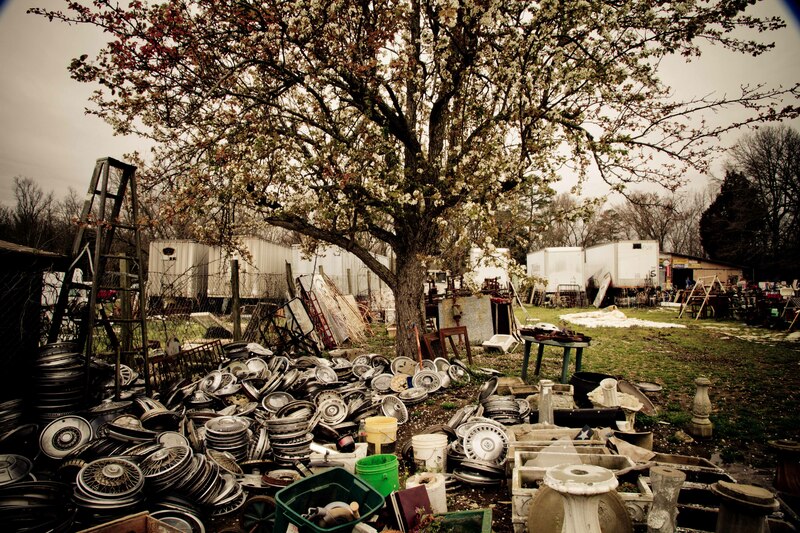 Pleasant reminded me that the eclectic junkyard and former farm holds many of the area’s hidden treasures, if you’re willing to take a short drive into the country. Decorating with antiques offers households a way to use time instead of money to adorn living spaces in a unique, personalized style. Creative projects can help combat the winter blues and give us limitless options when it comes to turning something old and useless into a utilitarian item with a purpose, by solving design dilemmas with original, antique-inspired solutions. And Charlotte’s mild winter climate gives us the chance to get outdoors to work on home projects too. 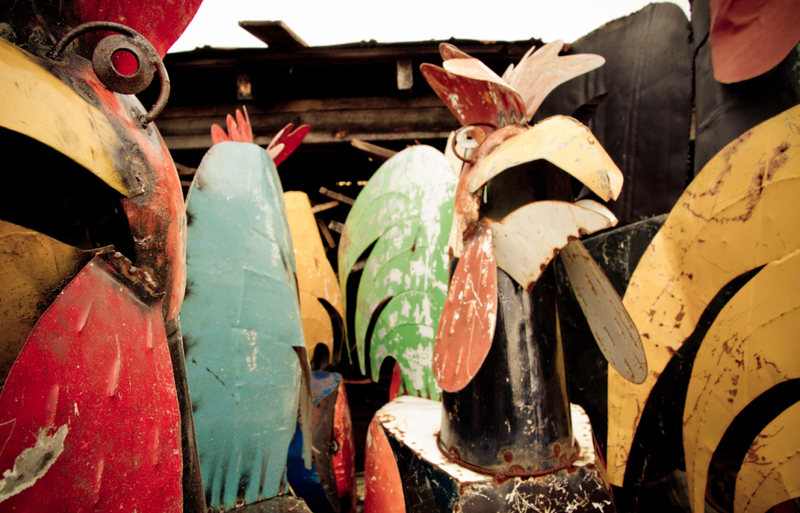 These images from Cline’s Antique Store inspire all sorts of eclectic home décor ideas. You can visit the old farm from 8am to 6pm on Thursdays, Fridays, and Saturdays to find your own materials and inspirations to help you decorate with antiques in your own home. 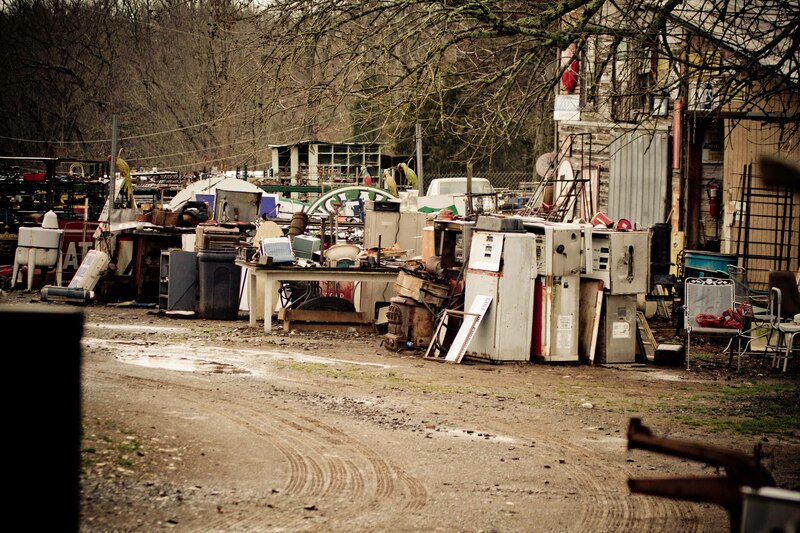 A long shot of the junkyard reveals the array of opportunities awaiting the DIY home-décor junkie. At a glance we can see everything from tables and chairs to the kitchen sink, literally. Homeowners pay a lot of money for newly manufactured farmhouse sinks designed to look just like some of the old sinks at Cline’s, which can be refinished to look just like new for a fraction of the cost. Old-fashioned metal mannequins like the ones pictured here are extremely hard to come by. These beauties can be used traditionally for sewing and outfit display, or they can be used to help organize items around the home in an aesthetically pleasing way. Try adding hooks to use one as a jewelry and accessory hanger, or decorating one of these as a non-traditional holiday tree. The garden cart in the foreground holds a lot of home décor options as well, both indoors and out. You can turn a piece like this into a plant stand, food service buffet, or a simple shelf. Speaking of the holidays, it’s never to early to start planning for next year. Cline’s has oodles of both newer and vintage holiday décor. Electronic items that no longer work can be repurposed into all sorts of creative holiday accents with the help of a few crafting supplies and some ingenuity. 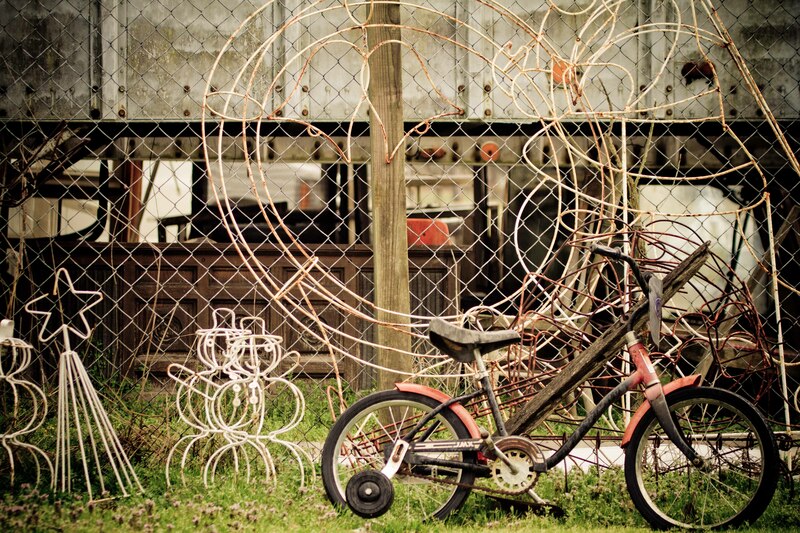 These old, rusty frames could become the base for a fresh holiday wreath or a new holiday lighting design. 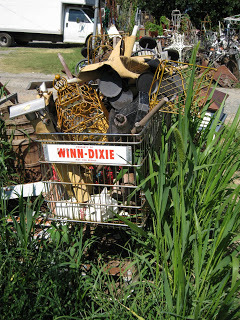 The contents of this shopping cart show just a glimpse of the treasures you might stumble upon here at Cline’s Antiques. 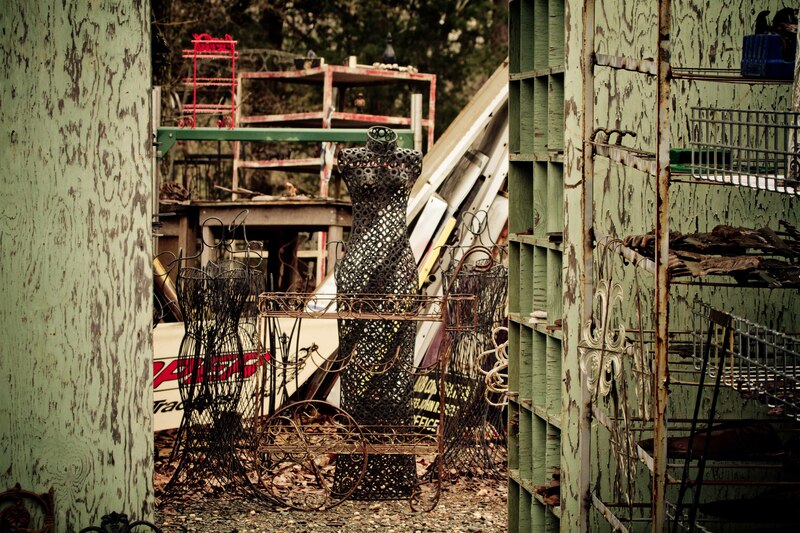 Old-fashioned bird cages and metal plant stands can be repainted for a fresh look that matches your home’s color scheme. Mantels, windows, and doors are expensive yet necessary architectural elements that can be salvaged and refinished or used as is for a very low cost. Many homeowners are choosing to keep the weathered, patina look we see here that can be difficult to achieve with anything other than true age. 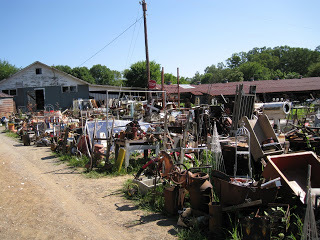 Cline’s has a lot of items that may not be salvageable for the home but can still be repurposed in the yard or garden. This old-fashioned children’s fire truck would make an excellent outdoor planter. 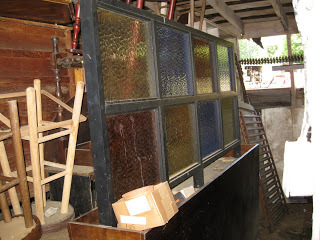 These beautiful old textured stained-glass privacy windows could be integrated into a room’s exterior wall during window replacement or a remodel. They add color to your home from both the interior and exterior perspective. From the inside they add sunlight and a view to the outdoors that maintains privacy. Hubcaps anyone? You can polish these up to create a unique wall display for an interior or exterior wall, or simply find one to help fix up your car. 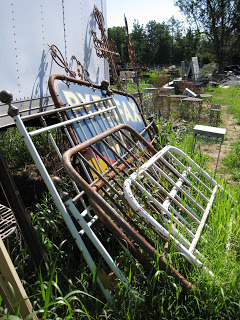 Metal headboards and bed frames can be used from everything from garden trellises to vintage photo displays. 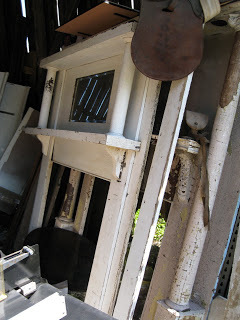 Many of the metal items you see in the foreground and background in the above photo can be easily refinished in a matter of hours with a couple of sawhorses and a can of spray paint. Ladders, headboards, metal bed frames, mirror frames, barstools, and metal chairs are all excellent items for repurposing in the home. With a fresh coat of colorful paint, a wooden ladder becomes a bookshelf. Use an old mirror as the frame for new art. 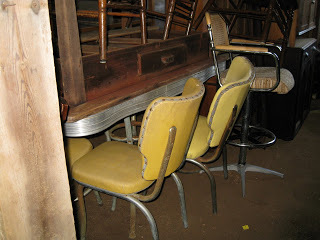 Reupholster old chairs and barstools for a modern look that saves money. Find six unique metal chairs to sit around an outdoor dining table. The options are endless at Cline’s, as long as you’re willing to use a little imagination.